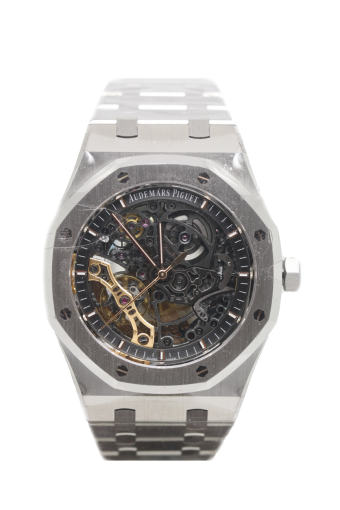 This very rare Audemars Piguet Royal Oak Double Balance Wheel Openworked features a fantastic insight into to workings of an Audemars Piguet with a full skeleton dial showing the stunning movement that lies within. A 41mm watch case in steel with display case back is mated to the steel bracelet. Cheshire Watch Company are supplying this watch complete with all boxes and Paperwork which is dated 2018 and the watch is still unworn and factory sealed.